This topic contains 122 replies, has 19 voices, and was last updated by Mike 7 months, 3 weeks ago. 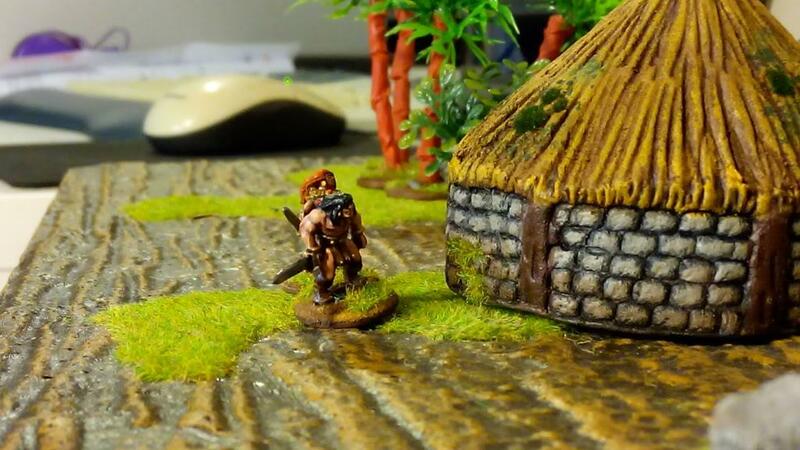 Ok ,so after seeing all the awesome terrain and now mini’s which Michael has been making for Crom’s Anvil, I finally broke down and have decided to return to my own 15mm Conan project. 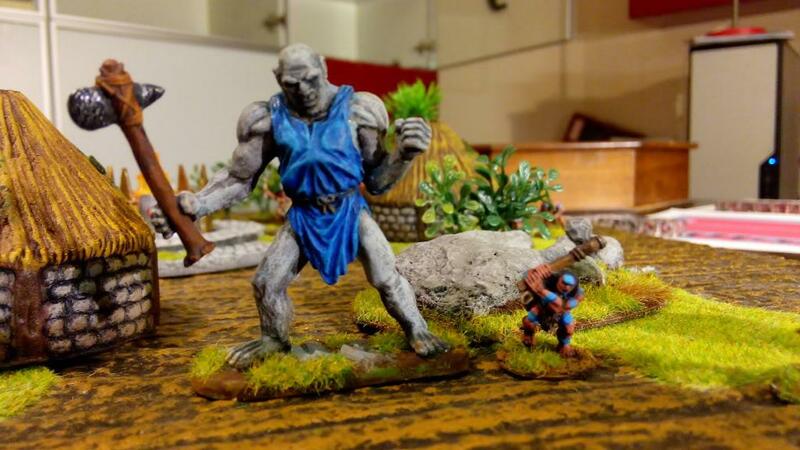 Now, as Planet Ares VI is meant to be for 6mm gaming and I don’t feel like starting another blog, I have decided to start this thread do document my progress. The first few posts will be stuff I have done already as I start pulling things out of storage to see where the gaps are in the stuff I already have and to help me decide where I want to take all of this. Lets start with the big man himself. 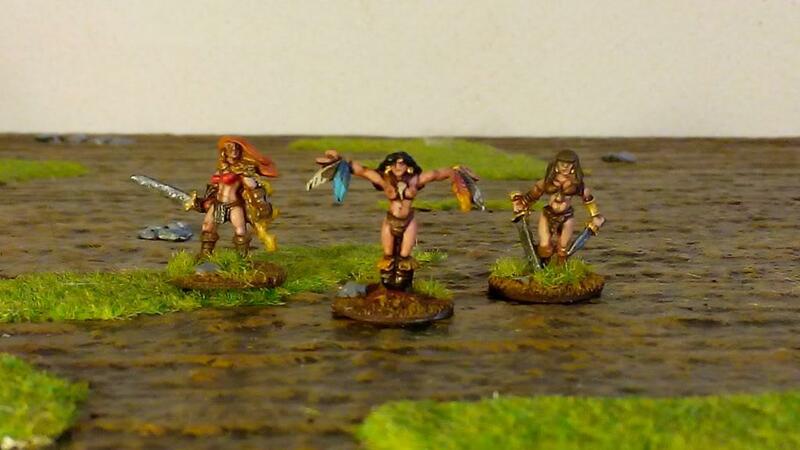 Here’s my four favourite poses from the Copplestone Barbarian Heroes set. I like to have a variety of different weapon and armor options so…. 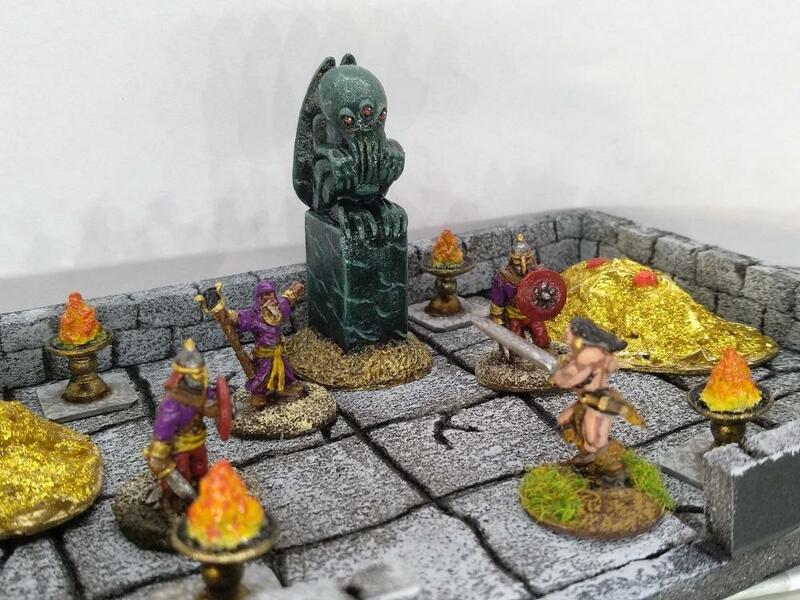 And some pics of the start of the first game I ever played with them, the introductionary scenario included with the crom rules, where the heroes have to stop the shaman from summoning a horrible creature from the abyss. 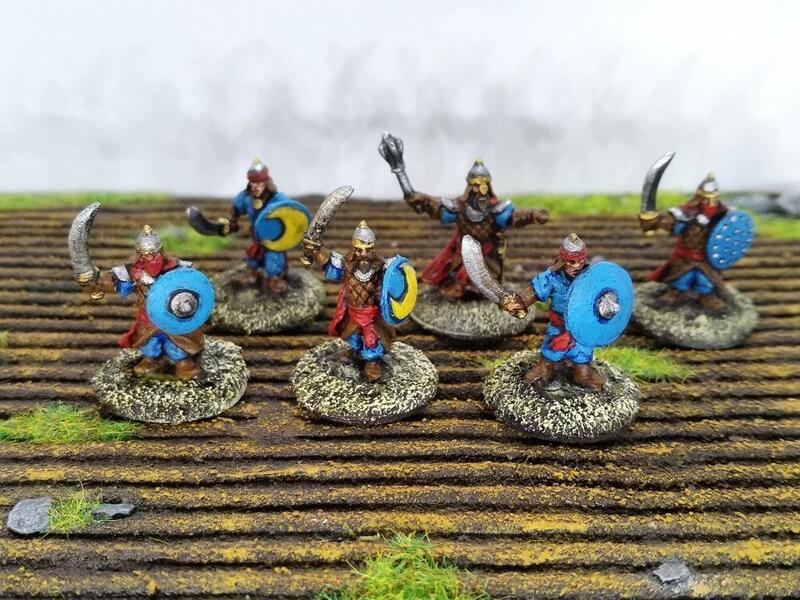 Next up, the minis and terrain I painted/made that haven’t made it to the table yet and then… …well I’ve already ordered a bunch of Men of the East from Splintered light and once Michael releases his new figs I’ll be getting those( plus some terrain) so we’ll see. This topic was modified 1 year, 5 months ago by Stroezie. This topic was modified 1 year, 4 months ago by Stroezie. I see Erlands brother in there too! The infection spreads! I too have been looking at stating this too. Looks really good Stroezie, bring on the new adventures! 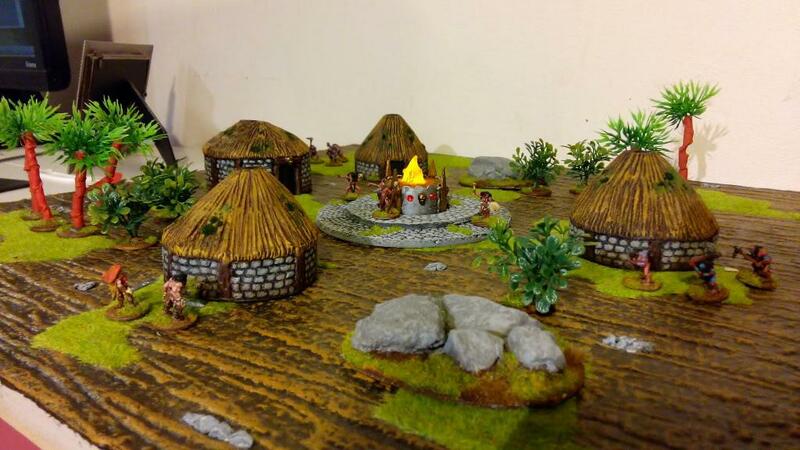 I am not in 15mm nor 18mm… but this is truly beautiful. It seems like we are all suckers and are getting tempted by new things. Must resist though. Outbreak of “Ooh shiny!” syndrome imminent! 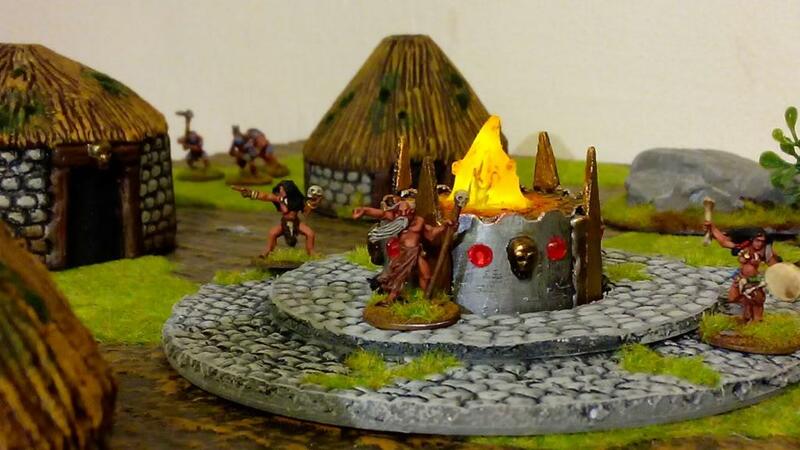 The idea behind these was to have a scenario where a small band of heroes have to defend a circle of standing stones against a summoned horde of demons and try to hold out till dawn. The stones are enchanted with an ancient spell of protection to keep evil out but it is failing and each round a random number/type of monster manages to break through. This reply was modified 1 year, 9 months ago by Stroezie. 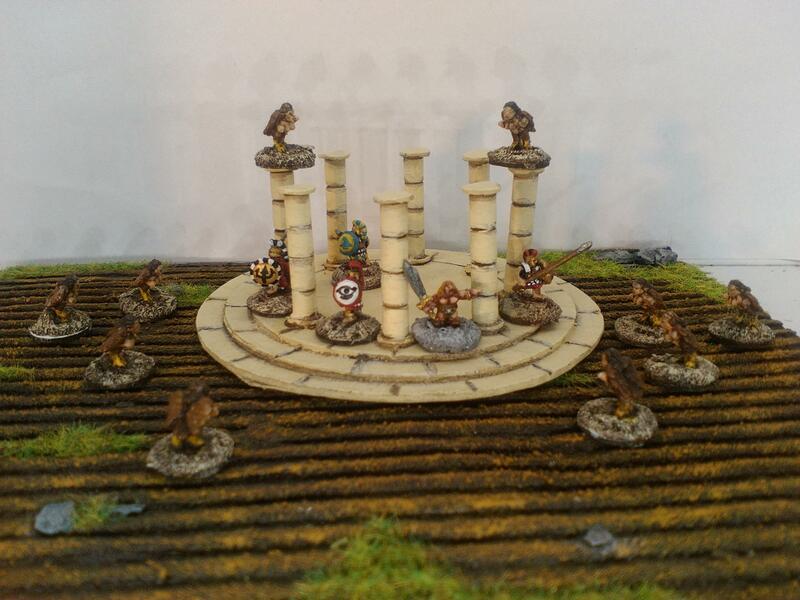 When I get my resin/silicone restock next week I plan on sorting some pillars out and doing a ruined temple thing to defend, kind of want to do that scene from Jason and the Argonauts? with the harpy attack. 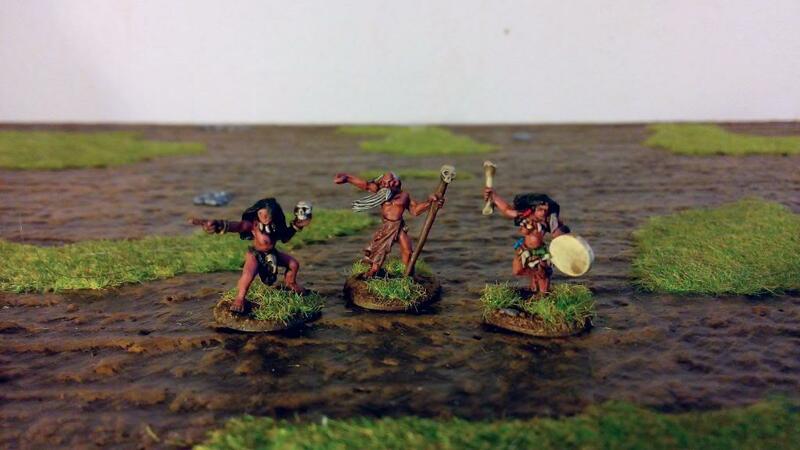 Ok so digging through the old miniatures I’ve found some giants, what do you think could they serve for Conan games to? And who’s to say all giants need to be humanoid? 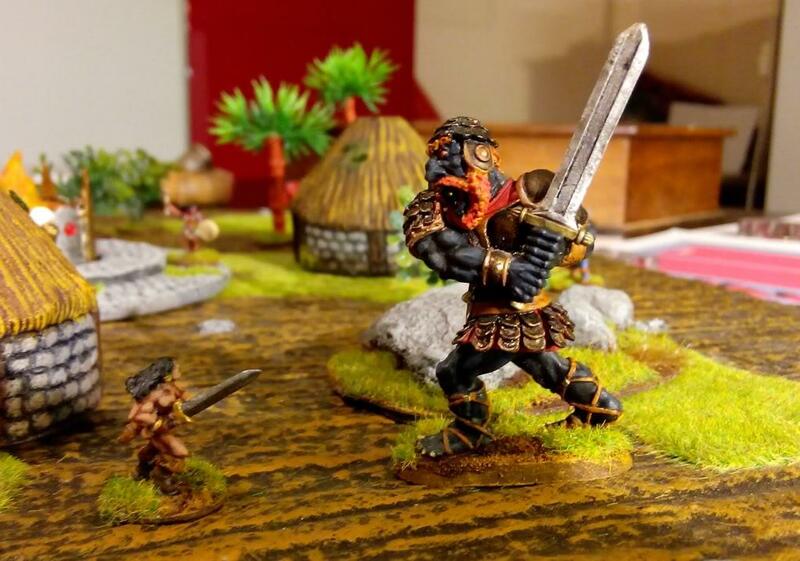 Maybe not for Crom but It could be cool to have two warbands and their giant ally duke it out? I like the Copplestone one best. Those are some gorgeous paint jobs. 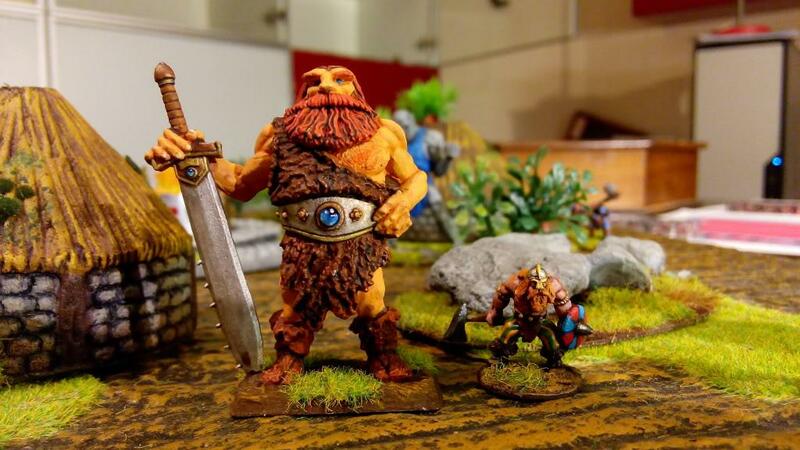 I especially like the first and third (the fire giant); wonderful old sculpts, both. 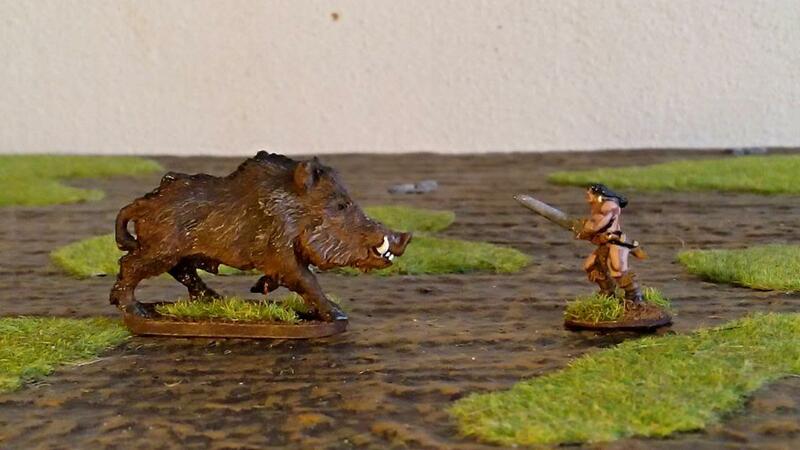 So as I was going over the Crom rules again I reread the mini campaign that comes with it. And then I noticed: it’s got snake people in it! 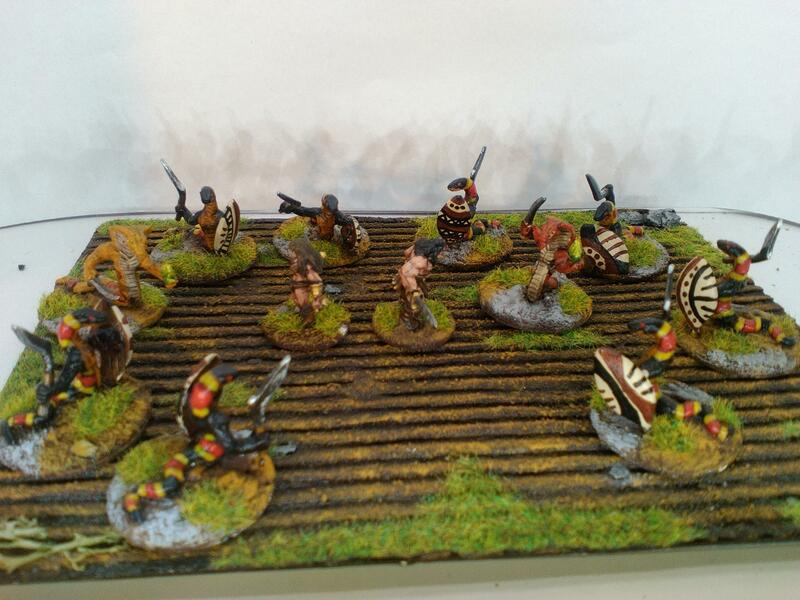 I remembered I have 15mm snake people,painted for a scifi rorke’s drift game I did once, so I decided to digg them out of storage and see how they would fit with the copplestone figures. Should our hero go to the jungle swamps and put an end to this serpentine menace? Crush the snakes of the Earth beneath your sandled feet! I’ll have to see about remedying that, anybody got any good suggestions? Rotisserie BBQ snake tastes just like chicken, but giant and more satisfying for having killed it in battle. Destroy those snakemen and eat them up, yum! 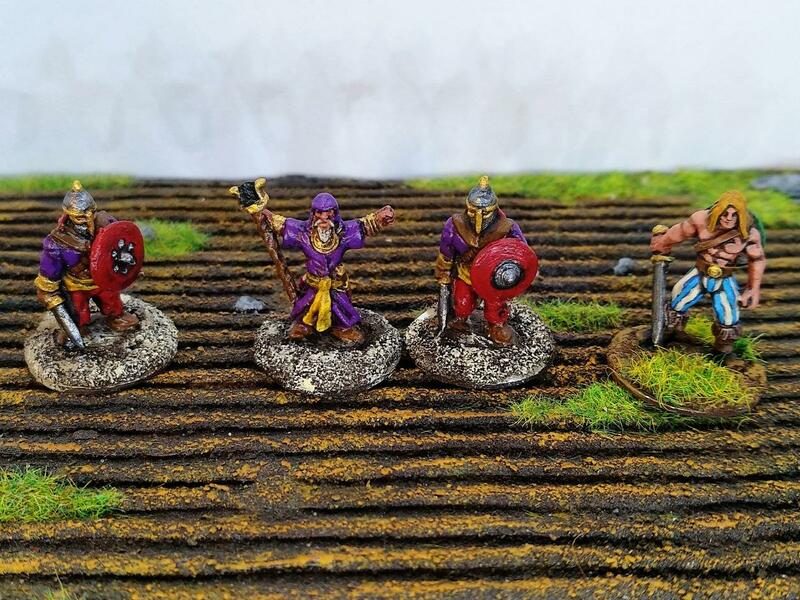 After being slightly, obsesively, side tracked by a 6mm Necromunda project I finally got round to painting some of my exellent “Men Of The East” from Splintered light. 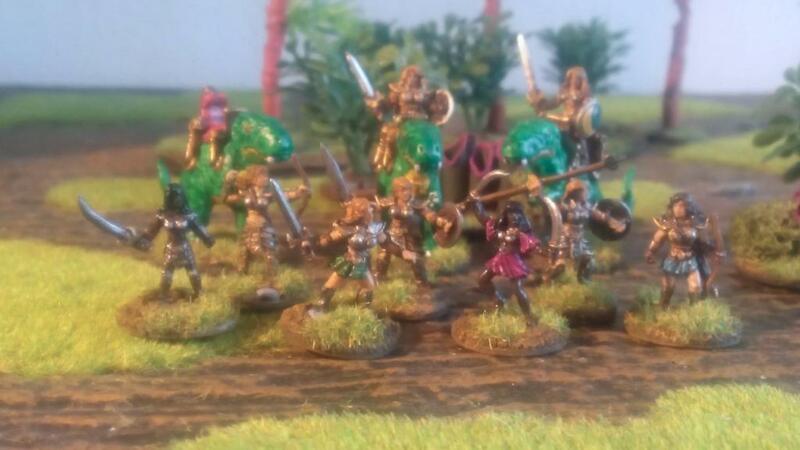 This line of mini’s was sculpted with the copplestone barbarians in mind and so they fit together perfectly. 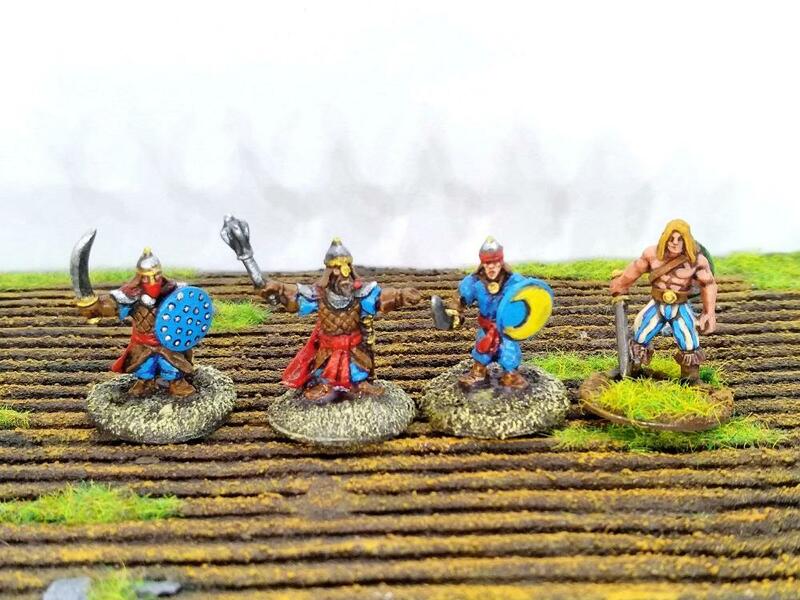 Next up will be a guard captain and two men at arms. 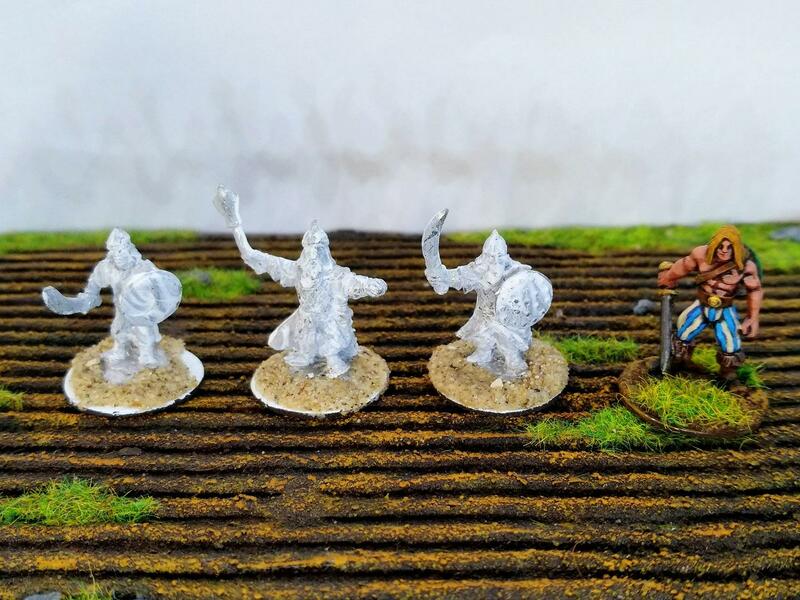 I have some more men at arms and some archers primed and ready to go to but I don’t know how fast I’ll be able to paint them, I had a bit of a struggle getting used to painting such HUGE figures again after all the 6mm I’ve been doing. 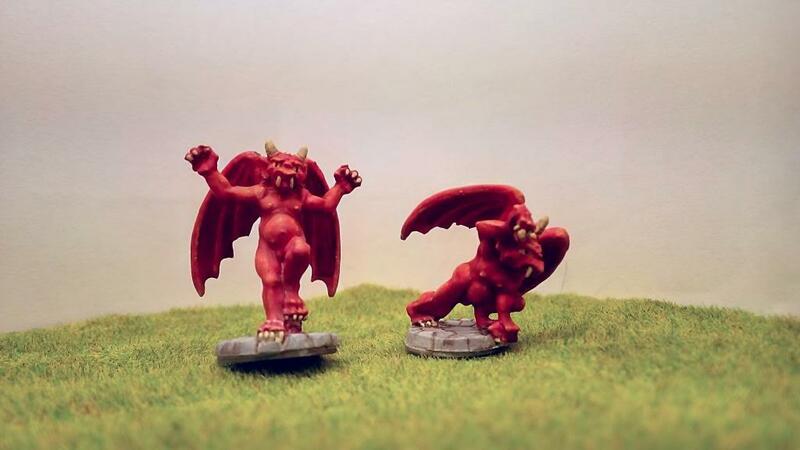 I just ordered some of these myself during the Halloween sale (haven’t received them yet), but then I started to have doubts about them as it suddenly struck me that their legs look very short in the webstore photos. They look much better in your photos, so I feel reassured again. 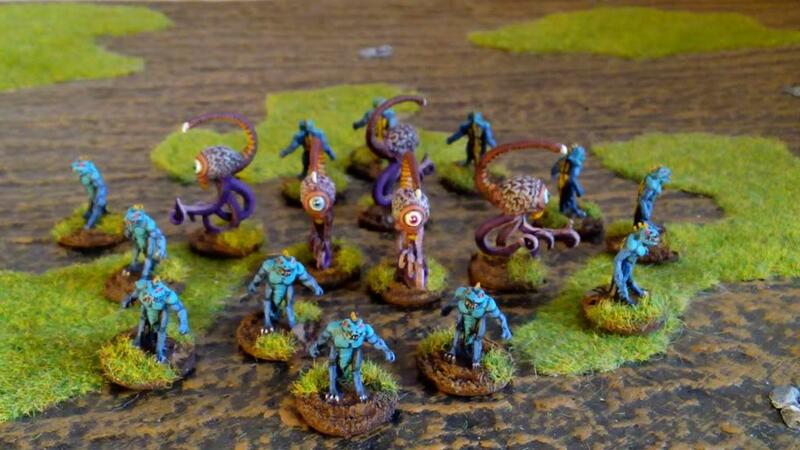 These guys look great, the paintjobs are lovely! Cool, it was a pleasure to be reminded of all of this. Stroezie, I’m not sure whether to thank you for this latest post. 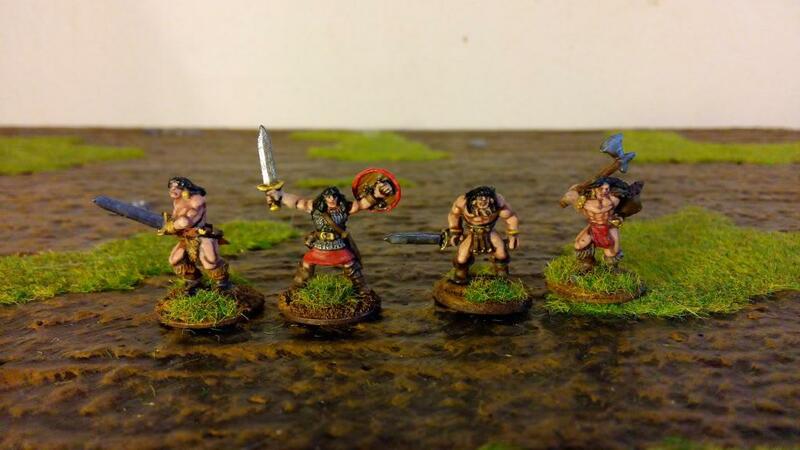 For several weeks I’ve been fighting to resist doing Conan in 15mm, thought I had a handle on it, and then you go an show your latest creations; suffice to say the inner turmoil has begun again. Should I thank you, curse you? I don’t know. But what you are doing is very, very beautiful. Please post again. The gods have shown you the way!! Life’s to short not to buy more mini’s, give in and join us, I hear there are some cool figures being funded right now, it’s the perfect exuse! Thank you for offering to be the scapegoat, Stroezie. 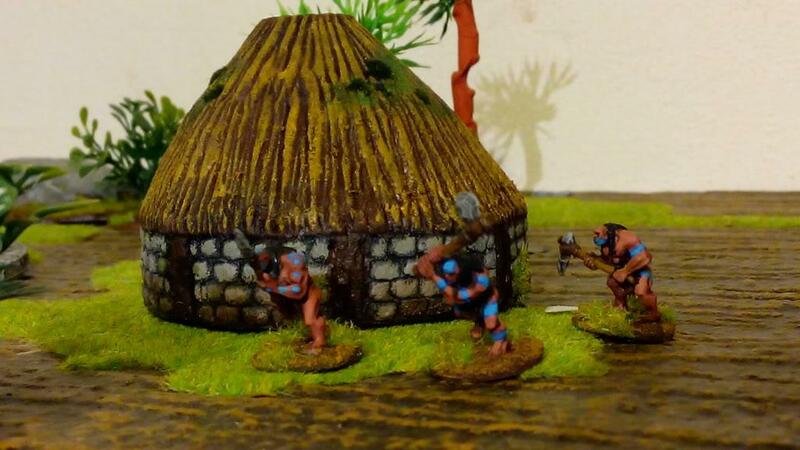 Trouble is I already have a small Conan collection in 28mm…but these figures and buildings are so d***d attractive, I’m seriously giving thought to giving it a go. 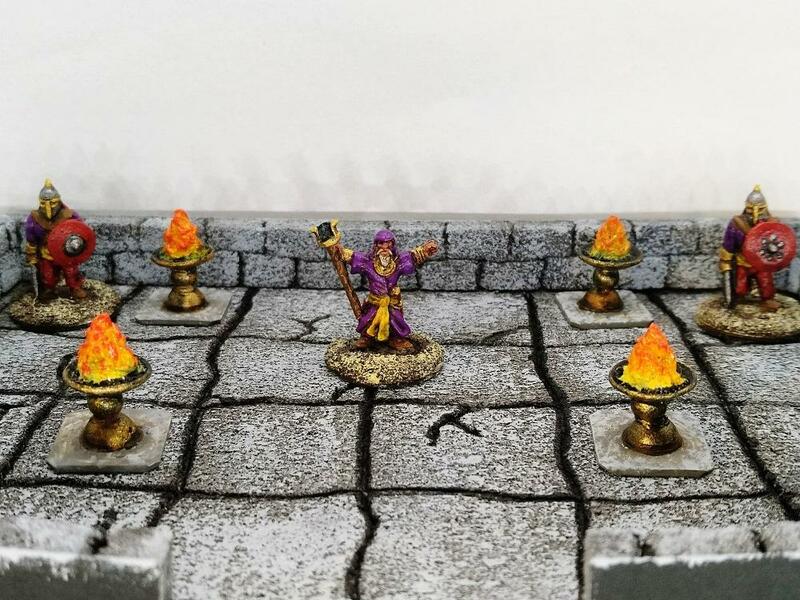 And inspired by Michael’s exelent rooftop brazier, I decided to see if I couldn’t conjure up something for my priest to… euh… conjure up… euh things with inside. 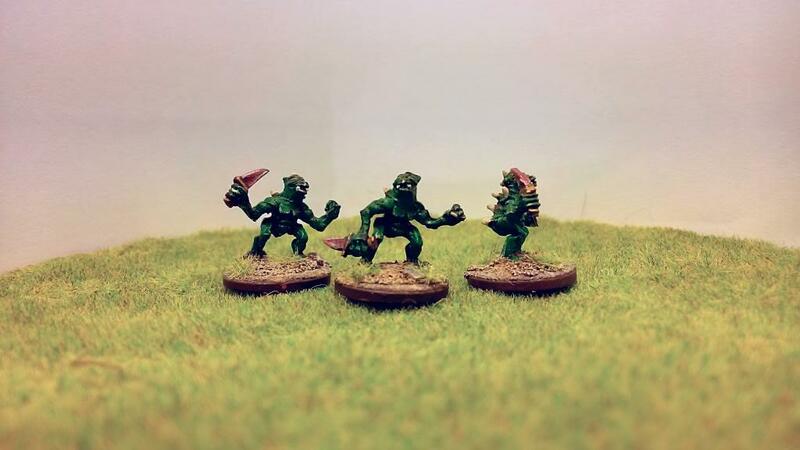 So a few beads, some decorative nails and a little greenstuff later I now have the perfect things for my heroes to kick over when they are being chased by a troop of guards. 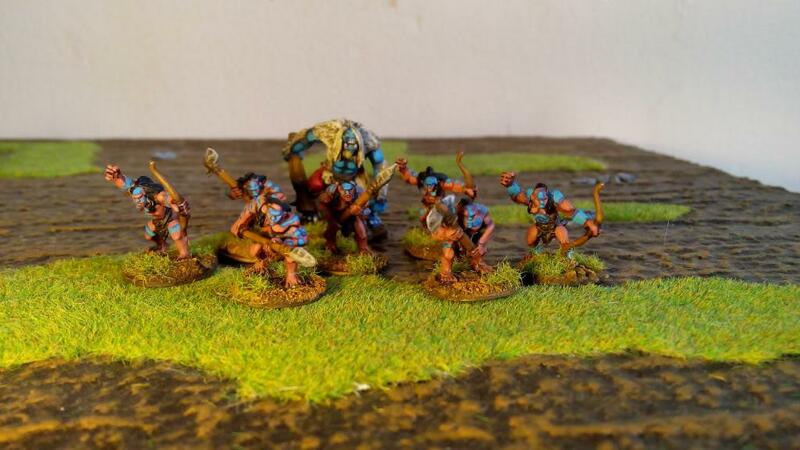 Now I’ll have to see about making some kind of summoning circle and of course I still have the bowmen to paint. They are wicked, I am doing something myself but my bowls are much deeper, which upon seeing yours is why I think I don’t like them. 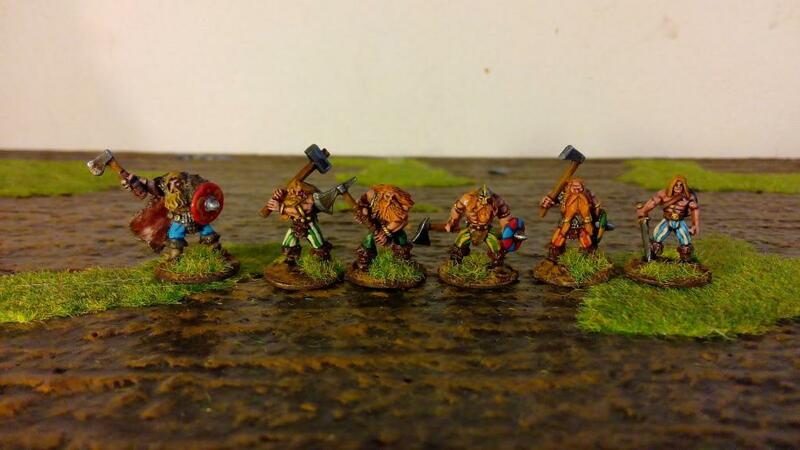 Do you have any images of the nails pre greenstuff? 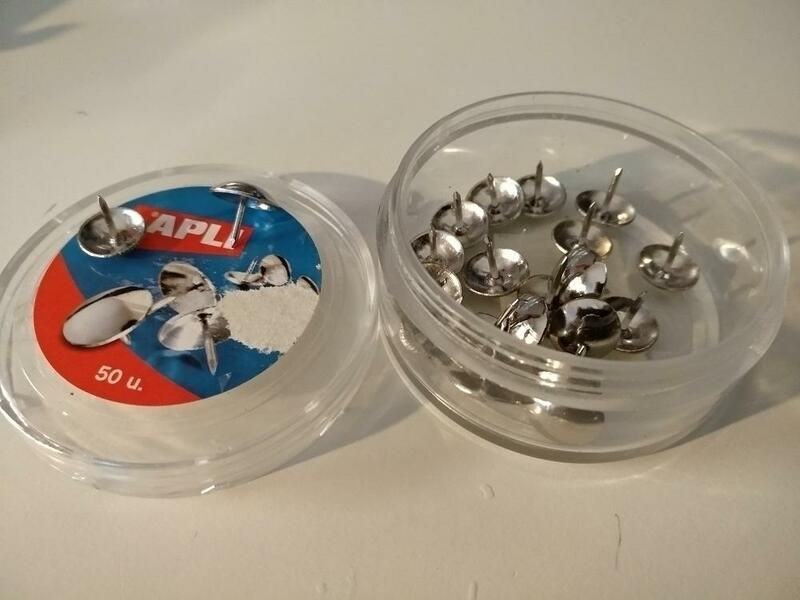 They are regular plain upholstery nails, you can find them in most do it yourself stores. Love the braziers and the wizard. 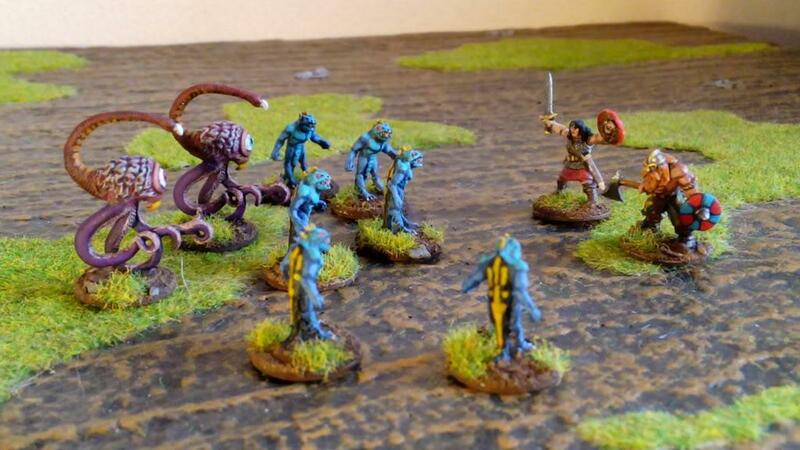 I’d love to see pictures when you organize a game. Do you plan to use CROM!? Had time to paint a little more today and this thing sorta jumped to the front of the painting que. 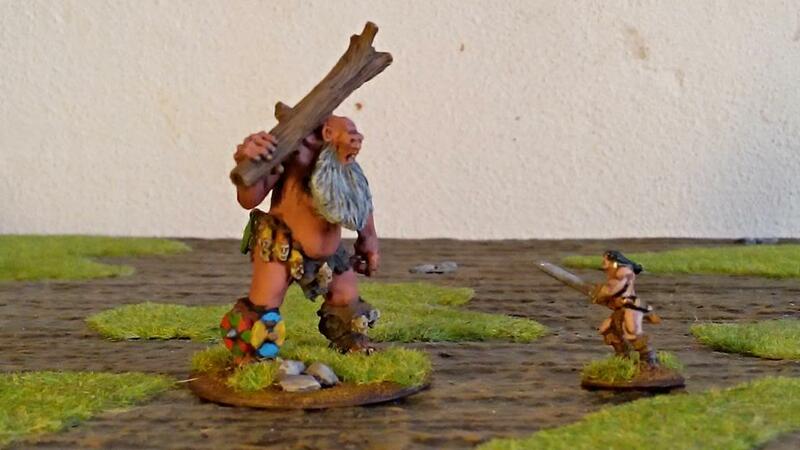 One of the very few 15mm scenery pieces I ever bought, the Elderitich statue from the Copplestone Barbarica range. I’ve always used Crom in the past but lately I’ve been toying with the idea of maybe adapting Pocket Quest as I’ve been thinking more along the lines of exploration/heist adventures than straight up skirmish. That being said Michael’s last adventure had some good sneaking rules, which made me gravitate back to Crom, but that still leaves the exploration part, I dunno maybe I’ll do a mash up of the two, we’ll see. Look at those piles of loot!! Exploration as in searching for traps and the like? Yep, checking for traps, lock picking, not knowing what’s behind the next door/corner (ie. building the map as you go) that sort of thing. I’ve been re-reading a lot of the old Conan stories and some of my favourites are the heists like The Tower of the Elephant. Ha, I think that was the last one I read!! trap difficulty vs special check. Traps are designed to take out normal plebs so we need to consider what a normal person can get, a minion technically has no dice in special but I ignored that for my stealth rules so will ignore that here. So a typical roll using full perception mode would be 7. Let us assume as a sort of benchmark a trap that you or I would probably detect: a pit in the dark. We will assume we are looking for traps. We could be shuffling, we could feel a draught, we could be vaguely aware of a slightly darker patch ahead of us. So I would say a 7 or more is needed to spot a pit trap in the dark if we are being cautious, ie moving very very slowly, so slow as to not really count in game terms. If we are walking, then we have 1 die in move and 1 in special meaning we cannot avoid the pit trap if moving. 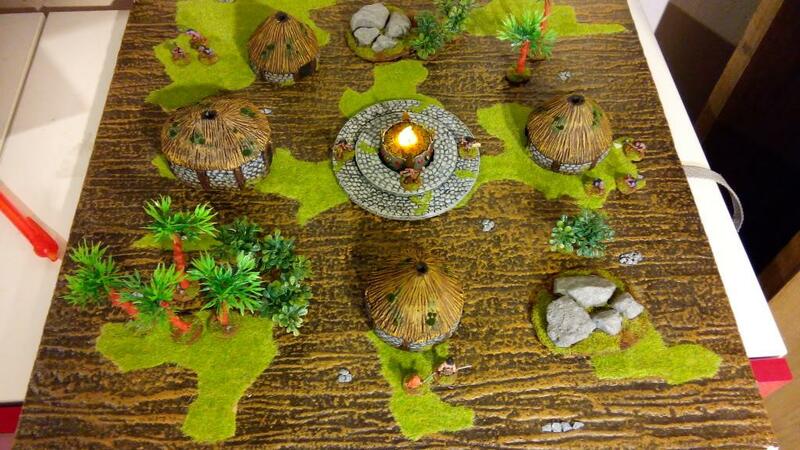 This to me seems a good base. Lock picking, I can’t pick locks, I doubt any regular person can. Locks were possibly simpler in Conan’s times, but then so were people! Now, Conan is not a technically adept sort, lithe, agile and what not yes, but not sure he is a lockpicker? I would be inclined to limit the amount of dice he can put into any special roll for locks and so on as half his dice pool. Also by restricting his dice pool means the need to bring a thief along, this aids the story and also means Conan has to keep the thief alive as well as himself. Feel free to ignore but seems like a sound starting block? Those are some excellent ideas, Mike. I hope one day we will get a Deluxe CROM! with all these nifty bits added. And a bestiary. Stroezie, couldn’t agree more over the liking the “lower level” Conan adventures. My favourites have always been those in which he is a thief or solitary wanderer, breaking into wizards’ towers and stealing stuff. Think Tower of the Elephant, Red Nails, Rogues in the House, etc…While the tales of him as a leader of men are also good, I always lean to the former. I’ll look forward to watching your progress.